Best wishes Erika & Antoine from Malta"
Welcome to Sunshine World Poland! The No1 British Tour Operator specialising in winter holidays to Poland. 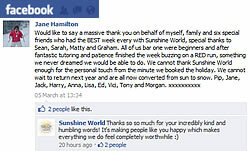 "Sunshine World's aim is to create for you some of the most perfect moments in your life!" Just wanted to say on behalf of all the Pearces, Mckinlays and C-T’s thanks for an amazing skiing hols. We were super impressed with the set up and all had a brilliant time. The kids are most disappointed to be back at school rather than flying down the slopes with Joseph, Barney and Georgia so please also pass on our thanks to them for making it such fun for the little people. Hope you have a great rest of the season and the glorious weather holds! Sunshine World is the First and Only Licensed UK Tour Operator organising skiing and snowboarding holidays in Zakopane, Poland with over 2,300 happy guests, over 15 international journalists and 16 people who have trained through our Professional Instructor Academy to become fully qualified, internationally recognised, ski and/ or snowboard instructors since 2005! Why not send us an enquiry form now to get our early bird prices on a holiday designed to YOUR desires now for the upcoming winter season? "Great Team, Great product. You boys will go far"
How to Become a Professional Ski or Snowboard Instructor During Your Gap Year ... click here! We had a terrific time and were well looked after the whole holiday. Our family were complete beginners but by the end of the holiday, we had all progressed massively and my three children aged 15, 13 and 6yr were skiing down red runs. Millie and Barney were just fantastic instructors and were also great company for our family in the chalet! Thank you very much. Hope you have a great new Year. I am already looking at flights to Krakow for next season...! Return airport transfers to/from Krakow . Best price £395 staying at the Sunshine Chalet or £415 at other chalets off peak excluding Christmas, New Year and February Half Term Three-star hotel package from £545pp or a four-star from £645 per person. 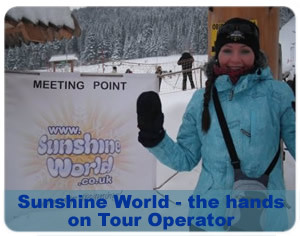 When it comes to skiing in Poland, Sunshine World is one of our favourite tour operators. 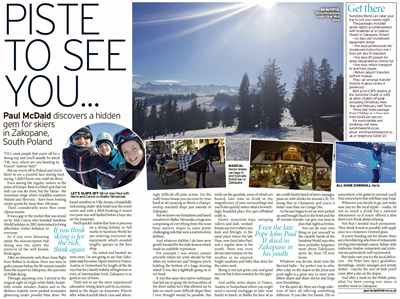 Not only does the Sunshine World team go the extra mile to offer an excellent service, but I defy anyone to beat their prices for ski breaks in the magnificent Tatra Mountains. Why not contact our friendly and helpful team to find out how we can tailor a holiday to suit your exact desires? Early Bird ski/ snowboard holiday SPECIAL OFFERS for winter 2019/2020 - Check out what we believe to be the BEST value all inclusive skiing holidays and snowboarding holidays in the world, EVER! Unbeatable full service, completely customisable holidays including everything on the ground from just £375 per person for 7 nights! Book now for best price! Sunshine World is the leader in skiing holidays in Poland and snowboarding holidays in Poland. If you are looking for the best, most fun and most exciting ski holiday or snowboard holiday then you have arrived at the friendliest and most professional snowboard and ski holiday company in Europe. We do the hard work so you don't have to! Proudly recommended by TV's "The Friday Night Project"
Krakow lies in the southern part of Poland, on the Vistula River in a valley at the foot of the Carpathian Mountains. The Tatra Mountains are 100 km to the south. One of the best all round ski and snowboard areas, Bialka has recently started to grow and take its ski area to a much more professional level. Kasprowy Wierch is located high in the middle of the Tatra Mountains, 1987m above sea level it is the biggest and most challenging ski area in Poland. You are viewing our ski/snowboarding holidays in Poland site!